Generator Presenter has been developed by a passionate team that understand exactly how to deliver the ‘umph’. 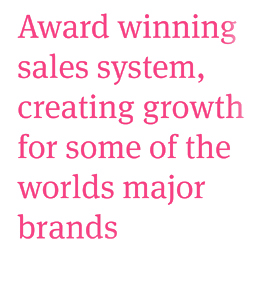 We combine our knowledge of sales psychology and consumer behaviour with our expertise in digital technology to deliver an award winning sales system like no other. Generator has been successfully implemented in over 30 countries around the world creating sales growth for some of the worlds major brands. Our dedicated team of sales consultants, creative thinkers and digital engineers will fully engage with your team, working at every level of your organisation to create a sales system that is tailor made for your business and designed to create persuasive sales experiences that your customers love to engage with. We believe success is achieved by working in partnership with you every step of the way. We have a proven and structured process that ensures Generator Presenter will support your sales ambitions and motivate your sales teams to find that little bit of extra ‘umph’.